Eigenfaces is a well studied method of face recognition based on principal component analysis (PCA), popularised by the seminal work of Turk & Pentland. Although the approach has now largely been superseded, it is still often used as a benchmark to compare the performance of other algorithms against, and serves as a good introduction to subspace-based approaches to face recognition. In this post, I’ll provide a very simple implementation of eigenfaces face recognition using MATLAB. PCA is a method of transforming a number of correlated variables into a smaller number of uncorrelated variables. Similar to how Fourier analysis is used to decompose a signal into a set of additive orthogonal sinusoids of varying frequencies, PCA decomposes a signal (or image) into a set of additive orthogonal basis vectors or eigenvectors. The main difference is that, while Fourier analysis uses a fixed set of basis functions, the PCA basis vectors are learnt from the data set via unsupervised training. PCA can be applied to the task of face recognition by converting the pixels of an image into a number of eigenface feature vectors, which can then be compared to measure the similarity of two face images. Note: This code requires the Statistics Toolbox. If you don’t have this, you could take a look at this excellent article by Matthew Dailey, which I discovered while writing this post. He implements the PCA functions manually, so his code doesn’t require any toolboxes. Greyscale images with a consistent resolution. If using colour images, convert them to greyscale first with rgb2gray. I used a resolution of 64 × 48 pixels. Cropped to only show the face. If the images include background, the face recognition will not work properly, as the background will be incorporated into the classifier. I also usually try to avoid hair, since a persons hair style can change significantly (or they could wear a hat). Aligned based on facial features. Because PCA is translation variant, the faces must be frontal and well aligned on facial features such as the eyes, nose and mouth. Most face databases have ground truth available so you don’t need to label these features by hand. The Image Processing Toolbox provides some handy functions for image registration. Steps 1 and 2 allow us to obtain zero-mean face images. Calculating the eigenvectors and eigenvalues in steps 3 and 4 can be achieved using the princomp function. This function also takes care of mean-shifting the input, so you do not need to perform this manually before calling the function. However, I have still performed the mean-shifting in steps 1 and 2 since it is required for step 6, and the eigenvalues are still calculated as they will be used later to investigate the eigenvectors. The output from step 4 is a matrix of eigenvectors. Since the princomp function already sorts the eigenvectors by their eigenvalues, step 5 is accomplished simply by truncating the number of columns in the eigenvector matrix. Here we will truncate it to 20 principal components, which is set by the variable num_eigenfaces; this number was selected somewhat arbitrarily, but I will show you later how you can perform some analysis to make a more educated choice for this value. Step 6 is achieved by projecting the mean-shifted input images into the subspace defined by our truncated set of eigenvectors. For each input image, this projection will generate a feature vector of num_eigenfaces elements. To perform face recognition, the similarity score is calculated between an input face image and each of the training images. The matched face is the one with the highest similarity, and the magnitude of the similarity score indicates the confidence of the match (with a unit value indicating an exact match). To detect cases where no matching face exists in the training set, you can set a minimum threshold for the similarity score and ignore any matches below this score. Above are the 20 eigenfaces that my training set generated. The subspace projection we performed in the final step of training generated a feature vector of 20 coefficients for each image. The feature vectors represent each image as a linear combination of the eigenfaces defined by the coefficients in the feature vector; if we multiply each eigenface by its corresponding coefficient and then sum these weighted eigenfaces together, we can roughly reconstruct the input image. The feature vectors can be thought of as a type of compressed representation of the input images. 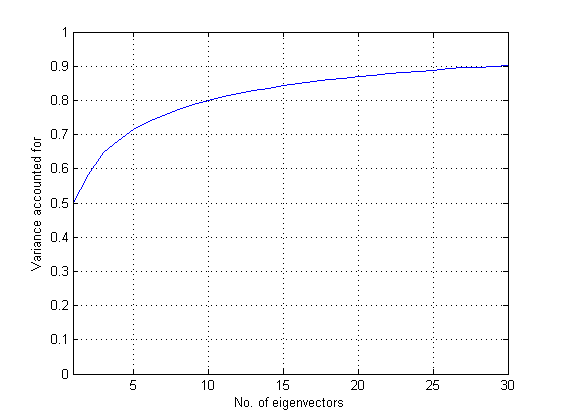 We can see that the first eigenvector accounts for 50% of the variance in the data set, while the first 20 eigenvectors together account for just over 85%, and the first 30 eigenvectors for 90%. Increasing the number of eigenvectors generally increases recognition accuracy but also increases computational cost. Note, however, that using too many principal components does not necessarily always lead to higher accuracy, since we eventually reach a point of diminishing returns where the low-eigenvalue components begin to capture unwanted within-class scatter. The ideal number of eigenvectors to retain will depend on the application and the data set, but in general a size that captures around 90% of the variance is usually a reasonable trade-off. Fisher’s linear discriminant (FLD) – selects subspace projections that maximise the ratio of between-class to within-class scatter. it gives the error that matrix dimension must agree while subtracting. What may be the problem? It’s hard to say – it could be the images were loaded incorrectly into the matrix, the mean face vector was calculated along the wrong dimension, the number of input images was miscounted, etc. When you run it, what are the dimensions of images and mean_face? And what is the value of num_images and what dimensions in pixels are the images you are using? Thanks, I solved the problem. I am looking for a tutorial for Fisher’s linear discriminant (FLD) and how to implement it with PCA. Your blog helps me a lot, can you please also publish similar blog for fisherfaces as well? Glad it helped you. I plan to write an article on FLD and NMF in the near future – keep an eye out. I have updated the code, on the previous line it was calculating mean_face along the wrong dimension. It should work now. Its good tutorial but I’m stuck. ??? Subscripted assignment dimension mismatch. To answer your other question, using Windows paths with spaces and backslashes is fine in MATLAB. You’ll need to explain the problem you’re having. Hey This is Sastry. I was trying to use your code. I find the following error. in the step 5 why? and what to do to resolve this. Now i have as much memory as i need. You should be training a single PCA classifier on all of your face images, not one per individual person. Did you test on more than one face? Did it match any faces correctly? Yes, in fact i have tried using single pca classifier considering the whole database at once(one folder containing 20 face images each of 20 individuals).I could only get a 28% success. I tried with other databases like clouds ,leaves,MPEG 7 CE shapes images database but not much difference. So i tried improving it by transforming the images to wavelets and then subject to PCA and it worked well.Now i can get a proper classification with a 70% to 84% success depending upon the database. Thanks for your blog, it helped me a lot. Possibly it could be related to the data set. It’s just a guess but because eigenfaces use absolute pixel intensities as their features, they are highly susceptible to lighting variations, whereas differential features such as wavelets are not. Do you have significant lighting variations in your face images? If so, you could try normalising the images first using a technique such as histogram equalisation. Anyway, glad to hear you got it working with wavelets anyway. hi weasels, may i know more about your way, i type code like alister, but with lucky, just 35% with high resolution picture. would u mind if u send me your code, plz. i’m having trouble with my final project. Just use feature_vec as the input to your neural network. I used a simple classifier based on Euclidean distance, but neural networks are just another form of classifier and work basically the same way. Hi. I have used pics with background. I tried to do everything you described in the way it is. For the input image i have used one of the test images. But the result is rather horrible which gives out some arbitrary image number with a very low similarity score of about 0.0002. Also when displaying the result it is not the image corresponding to the detected number, rather a black and white image with very few black image pixels. Can you point out the possible mistake that i am making? Note: I am not decreasing the number of eigen vectors. As a precautionary measure to test, i have used all of them. i m facing the same problem.If u have got the solution of above problem then plzz share.That will be a great help. File “input.gif” does not exist. I have a question. If I associate a parameter with each image in the training set, would I be able to use this technique for regression rather than classification with an unknown test set? What parameter do you have in mind? It may be possible if the parameter has a direct relationship to the face image (e.g. the subject’s age). Its effectiveness would depend entirely on what the parameter represents, what its relationship is to the principal components/facial features and what type of regression you are using (simple linear regression vs. more complex non-linear methods like neural networks). I am not using it for facial recognition. I would like to adapt this technique for another application. I have a bunch of images of galaxies, grouped into a test and training set. Each galaxy as a 2-tuple associated with it, which describes its ellipticity (e1, e2). Using the training images, I would like to predict the ellipticity (e1, e2) of the test set, for which it is unknown. To reduce dimension, i would use PCA to get a feature vector using the same method described above. However, I cannot find any literature about using feature vectors for regression. I’m very much new to Machine learning. i have to complete this project in the coming months ..
when I look at the eigenfaces I get from the program, I get nothing like yours. I very dark pictures, almost all black with a bit of gray lines. I am using the same database u used and I cropped the background out. so I have pics of faces without the background. If you increase the contrast of the images can you make out anything? I think I found my mistake. The images in the database were without background but the faces were not aligned to the center, so I had different positions of black background giving me much more variance, which was represented by black spots. I believe if I try with center-alligned images it will work. Thanks. Can you tell me how did u center align the images? Hi.i am facing the same problem as Irlmaks. I have used pics with background. I tried to do everything you described in the way it is. For the input image i have used one of the test images. But the result is rather horrible which gives out some arbitrary image number with a very low similarity score of about 0.0002. Also when displaying the result it is not the image corresponding to the detected number, rather a black and white image with very few black image pixels. Can you point out the possible mistake that i am making? could u plz explain the significance of calculating the eigen vector in this algo???? the problem u r facing is that u r using rgb images…..first convert it into grayscale and then use them to make the training set.I m posting a part of my code .hope u will get help from it. Out of memory. Type HELP MEMORY for your options. what is this error related to ? could you help please… ? User princomp with the ‘econ’ option. That should help! at the step 6-[evectors, score, evalues] = princomp(images’);, it is giving an err ” Out of MEMORY”…. Can u plz help me to solve this err??? ??? Index exceeds matrix dimensions. Hi I see your havn the same problem as me with this code. Just wondering did you manage to find a solution? Hi, I am currently doing something similar in my college project and just testing out your code so that i can get some practice results. Why do you use princomp(images’) and not princomp(shifted_images*shifted_images’) ? I thought PCA was using the eigenvectors of the symmetric matrix : shifted_images*shifted_images’ ? also, evectors is not the any code in matlab 7.5.0. I saw that in help menu of matlab. can you suggest me,why this occur? what is the solution of it? evectors is here only a variable. Its not a function of matlab. I have the problem while displaying the eigenfaces. I get totally black squares where it is supposed to be the eigen faces. I have converted the rgb images to gray scale. Can you let me know whats the mistake? Some of you guys are having problems displaying eigenfaces. You might be getting black like images. where do i download the full matlab code? Hi, I have tested your code above, but when it runs, it appears black boxes in the position of the eigenfaces and also the same applies when it tries to find the matced image near to the input_image. What should I do? Also is it possible to give us the full matlab code to test it without having errors? thank you so much in advance..
hiii mail me the complete code plz i have to submit it for my project thank you. can you mail me this code? my id is ” pnehal64@gmail.com “..
please what is the error? my faces database has 100 images, grayscalee and size 64×64 all. Nice post. Explains things really well. Would you please do a post on HOG feature pyramid also? To RESHAPE the number of elements must not change. why i am getting this error?? Are the image dimensions Ok? Try reversing the dimensions. Once I too made a similar mistake. Can ne 1 pls explain wat this function does..?? First of all thanks for a really useful piece of code! I’ve been struggling with some errors for some time but finally I managed to run it successfully. Thanks to everybody for the comments that I used to track my problems. I used clear and full installation of Matlab R2010b. img = im2double(img); % Thanks to this line the best match is shown. Without it it was just a white space. I am having a problem in the results. I am always getting a completely different face from the input image, although the same face is in the training images `images`. Anyone can help? Can anyone please help me to resolve the following error. ??? Out of memory. Type HELP MEMORY for your options. Hi stafik…. i tried using ur code i am still facing many problems… Few Queries..
features = evectors’*shifted_images; % here what does the quote (‘) stands for??? I face dimension mismatch problem during matrix multiplication ie. Would it be correct if we write the above step like? How to solve the error “to reshape the number of elements must not change” in display eigenvector. and i am using 10 images in the directory so is it the problem with the “num_eigenfaces”. How much i should take??? why this error is coming can anyone help….ty!! Here, why to calculate the row mean for the sample data? Since the column means the dimension, why no calculate the mean with col? like mean_face = mean(images) ? Truly i couldn’t ignore saying thank you. it is a great tutorial that i could step in AI world with. I really appreciate your help. but I have problem in seeing images. could you please upload a pdf version. and what;s more may i please get your help about implementing some face recognition articles? thanks again. I have one problem related to face recognition using eigen face method.If we want to recognize the face from the crowded image then what technique should be used? Hi, as I can do so that when there is no face to me an error message … thanks …. please can anyone help me .Thanks in advance. hello i can not see eigenfaces as you display what can i do? sir pls can u send me code to vijaysb107@gmail.com. I hae a database in which the background is present, i don’t want to manually crop all the pictures to give only the face, is there a way to do this on matlab? now when it comes to my problem , I am having hard time with the similarity score , I mean if I have only one image in the folder having images to be searched ,code works fine and gives a similarity score of 0.1 or close when the images are the same or very similar .However ,if I have more than one image in the folder ,code yields 2.5 *10^-3 or close as the similarity score . why does the code do that when there are more than one images in the folder having images to be searched. Thanks so much in advance. Have a nice day. This post is very informative but it took me a long time to find it in google. feature_vec = evectors’ * (input_image(:) – mean_face); I have this error . pls help Inner matrix dimensions must agree. Do you have any idea how to solve this error. Thanks so much in advance. Have a nice day. Plzzzz do tell me I hav jus used three images in my training set n I hav copies its location to input-dir so all the three different images will be processed..
please anyone post the complete correct code here with out any error it will be really helpful thank you. I am using PCA and I completed with PCA. I found all the eigenfaces and feature vector but I dont know how to reconstruct the image using these eigenfaces. How to reconstruct image using PCA?? Has anoyone been able to get this code to run with no errors? I have gotten multiple errors with the code. i am simulating your code but it give error…can you please send me matlab file code…”ejaz4616@qq.com”…i will be very very thankful to you for this…thanks in advance.. I have a problem. can any one of you solve my problem?? Hai.. Can you tell me how to calculate feature for more than 1 image and where & how to store it separately.. Please suggest me.. Please can any one send me the code for feature ectraction using dct algorithm.. The classification code is missing and/or not available to use – this crucial part of thew code is needed to complete classification and display the correct answer. This creates diffuclty for me to use it for clsssification suing neural net.Can you please help me out!! взлом вайбер	– Услуги Взлома мессенджеров viber, Как взломать вабер. I would like to propose the link exchange deal with your website blog.cordiner.net, for mutual benefit in getting more traffic and improve search engine’s ranking, absolutely no money involve. We will link to you from our Fashion and Women authority site – https://www.souledamerican.com/, from its homepage’s sidebar. In return you will agree to do the same to link back to one of our client site, from your blog.cordiner.net’s homepage too (sidebar, footer, or anywhere on your homepage), with our brand name Harajuku Fever.